Being able to identify different koi varieties is part of the fun of getting involved with koi fish. Koi varieties are distinguished by coloration, patterning, and scalation. Some of the major colors are white, black, red, yellow, blue, and cream. While the possible color variations are virtually limitless, breeders have identified and named a number of specific categories. The most popular category is Gosanke, which is made up of the Kohaku, Taisho Sanshoku, and Showa Sanshoku varieties. Butterfly koi (also known as Longfin koi, or Dragon Carp) were developed in the 1980s, and are notable for their long and flowing fins. 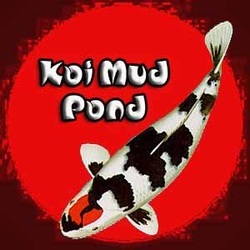 There are other hybrids of koi with new koi varieties being actively developed today. Ghost koi were also developed in the 1980s, and have become very popular in the United Kingdom. They're a hybrid of wild carp and Ogon koi and are distinguished by their metallic scales. 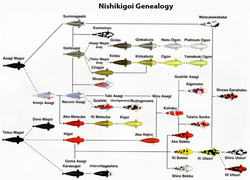 Butterfly and Ghost koi are considered by some to not be true Nishikigoi. Find out why TerraPond minerals are so important to koi and humans in this exclusive interview. Click here to go to go to TerraPond. Use this section to learn how to identify different types of koi by how they look. Also view what a champion koi is all about. We are working on finishing all sections. If one section you wish to view is not available, check back. Each requires hours of work. If you want to add information to the library so we can have a more comprehensive resource for all, please send us information and be specific email here. This library is designed to bring together koi information in a way that will further the knowledge and interest so that appreciation can expand all over the world. Click "Hakari Moyomomo" and "Kawarimono" to see our three latest pages for Chagoi, Benigoi, and Matsubu. Click Hikari Utsurimono to see new Kin Showa page and Hakari Muji to see Ogon.